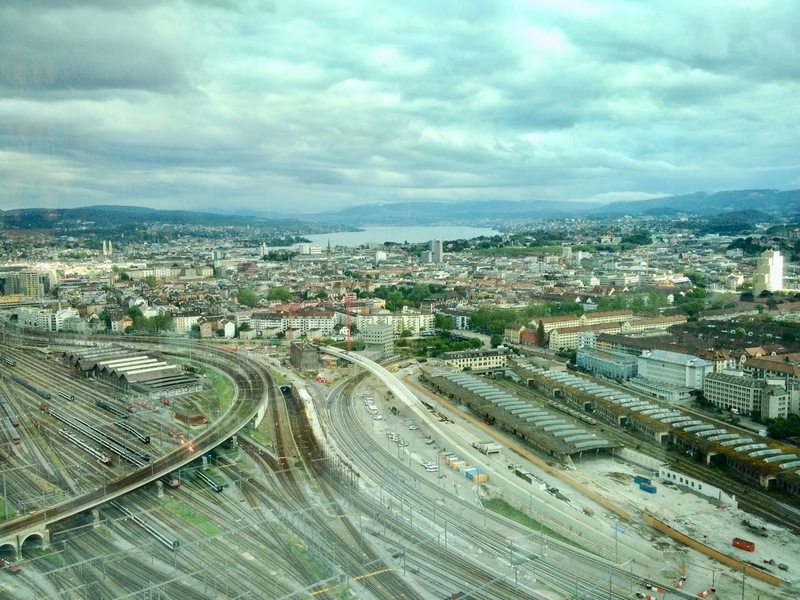 There are huge development projects under way on different sides of the Zurich main railway station. In one of them, Europaallee, on the southwest, you find the complex where Antonio Colaianni found its current work place, the Gustav complex. Here a view from Zurich’s highest restaurant, Clouds, formerly headed by Antonio Colaianni, towards the city, dating from a few years back. The neighborhood of Europaallee is located on the right side of the railways’ right side if you follow them further to the left. 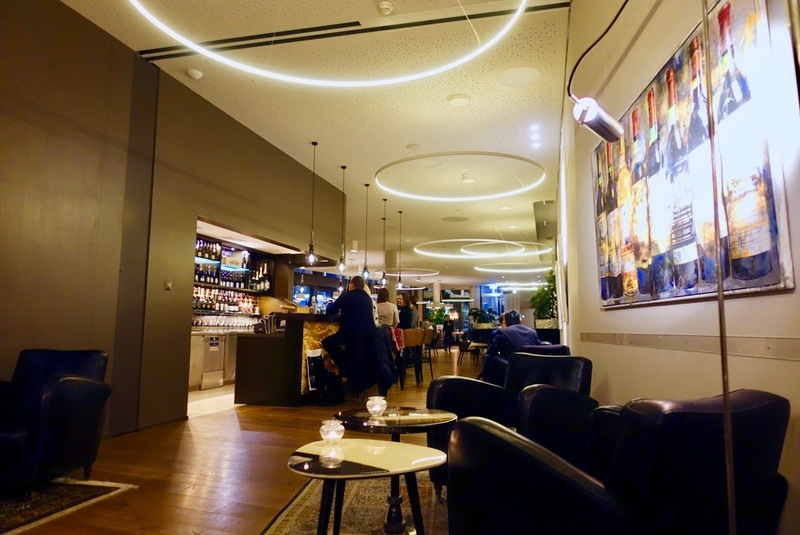 The mentioned Gustav apartment block, right next to the main railway station, is comprised of a restaurant and a bar as well as a café and a confectionary, everything overseen by Antonio Colaianni. In addition, you find onsite serviced apartments. where you can choose from over 120 varieties in every price range before heading to the dining room. The place is huge – 80 seats are available for a sophisticated fine dining experience –, airy and gives much personal space for the individual tables. Although its size and the fact that that it was fully booked, we never were disturbed by noise as the ceiling is sound-damped. There is also an outdoor restaurant with room for 30 guests. 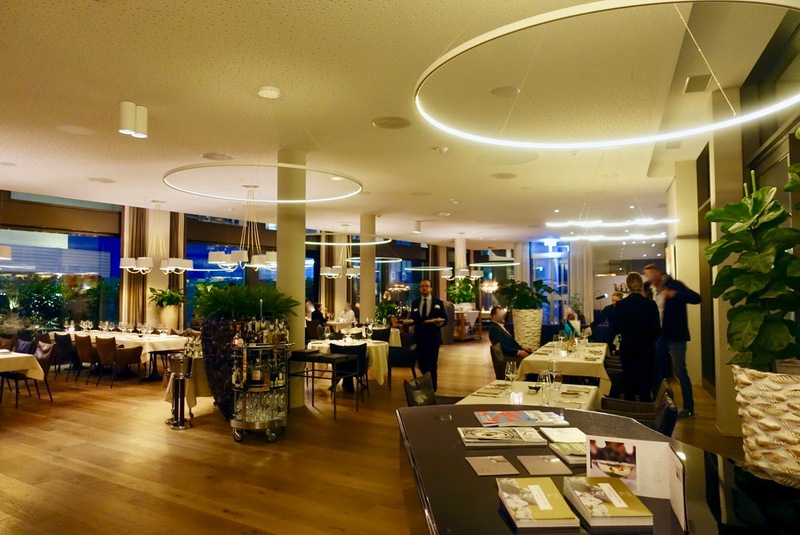 Restaurant Gustav is contemporarily furnished and feels like the dining room of an upscale hotel. Staff is plentiful, hospitable and attentive without being intrusive. It hit the perfect notes of warmth and friendliness with that touch of formality that you expect from an establishment of this kind. We dined here on a Friday evening, when also some kind of group event was going on. Most of times, service was paced just right. If we had been in a hurry, we probably would have judged the service as a bit slow, but we had all the time in the world and did not mind. 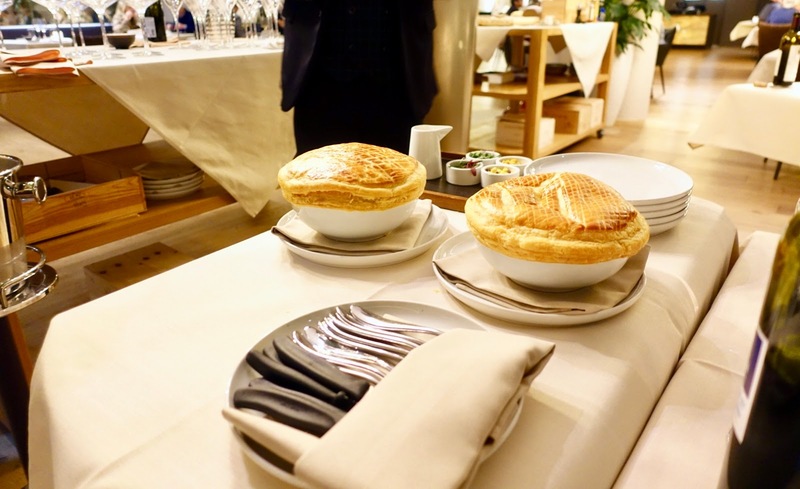 While I mentioned at the beginning that I was glad to have had the chance to dine at a restaurant where Antonio Colaianni is still at work, this is technically not the case as he does not longer stand in the kitchen himself. Chef de cuisine is Antonino Alampi, with whom he already worked together at Restaurant Casale in Wetzikon near Zurich. 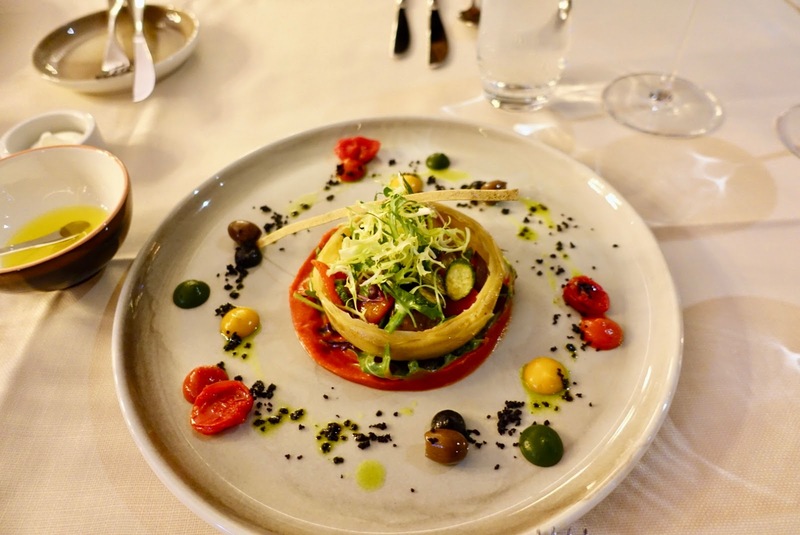 When it comes to the kind of cuisine you get at Gustav, you might expect Italian cuisine here as not only the head of gastronomy but also the chef de cuisine have Italian roots. This is not entirely accurate. Antonio Colaianni has its own signature style, you find French, Italian and other specialties, modernly interpreted, and with his own personal touch. On the menu you find a section with the chef’s classics (all starters), cold and warm starters as well as a number of main courses. In terms of desserts, four sweet variations (chocolate, blood orange, mille-feuille, lemon tart) were available and cheese from the trolley. You can also order a surprise menu, however only for the whole table. 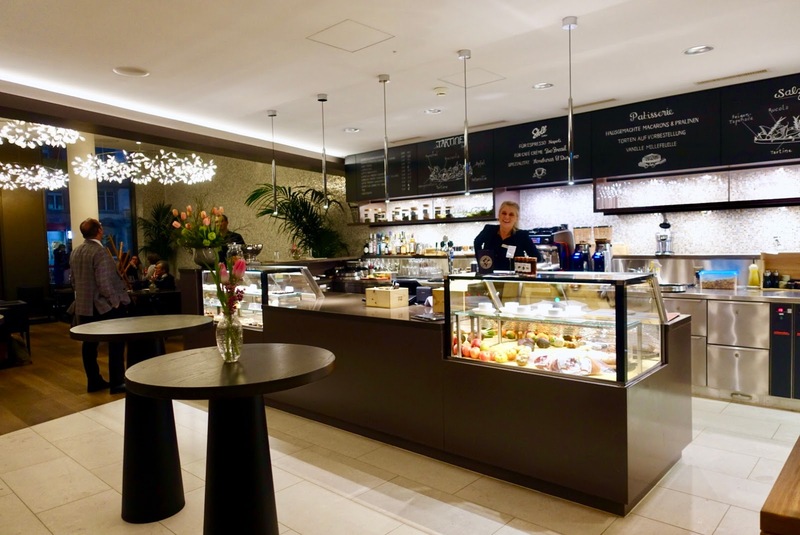 Price wise I was astonished to see that a restaurant of this class in Zurich – it is awarded 17 Gault Millau Points (one more than last year) and a Michelin Star (new in 2019) – is able to offer such fairly calculated dishes. Starters are available as from 15 SFR to 31 SFR, mains with meat or fish cost between 49 SFR and 59 SFR. 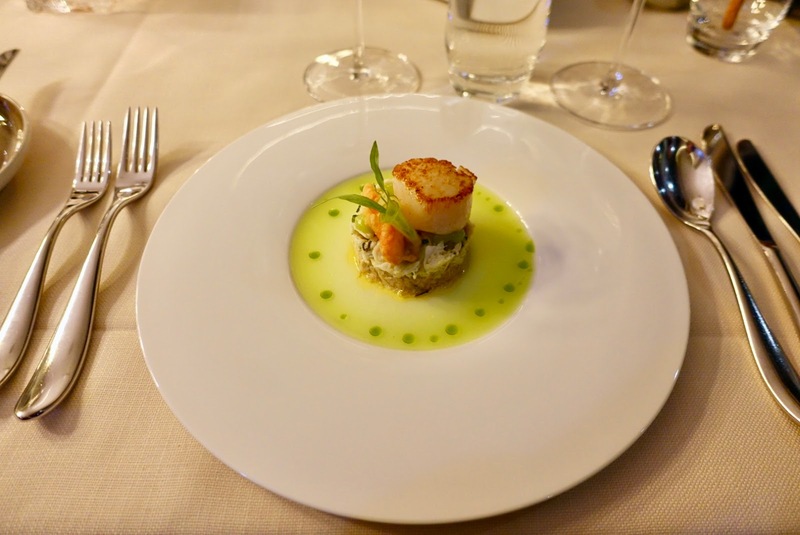 The surprise menu ranges from three courses at 95 SFR to six ones at 145 SFR. 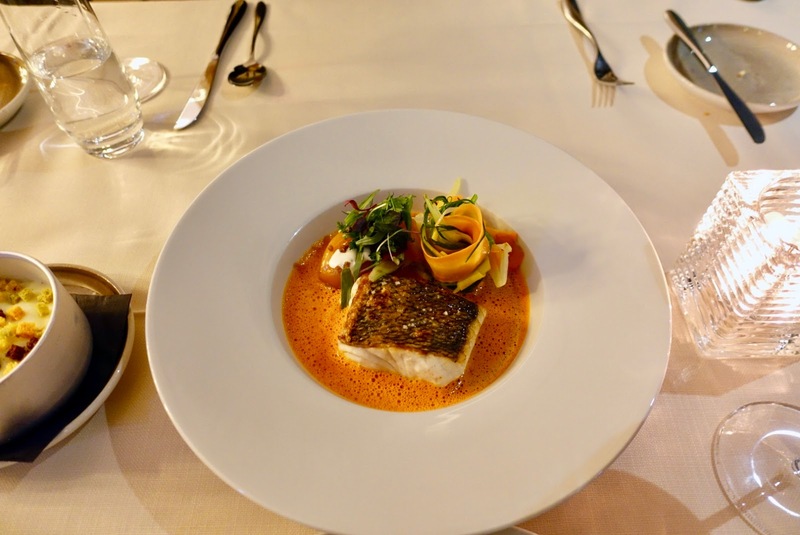 It may be true that the chef used to perform a more elaborate cuisine in the past (at other restaurants), but without doubt you get refined creations with good quality products here, and this also in quite generous portions. although I would normally not order a fish soup, and it was the right thing to do! The server put a plate with a beautiful arrangement of sea food in front of me and poured afterwards a deeply red, silky soup over it. What a blend of flavor and aroma! I can fully understand now why this dish with its complexity both in width and depth is regarded as legendary! By the way, it can also be ordered as main dish. a dish that to my eye was just right in terms of portion and composition. 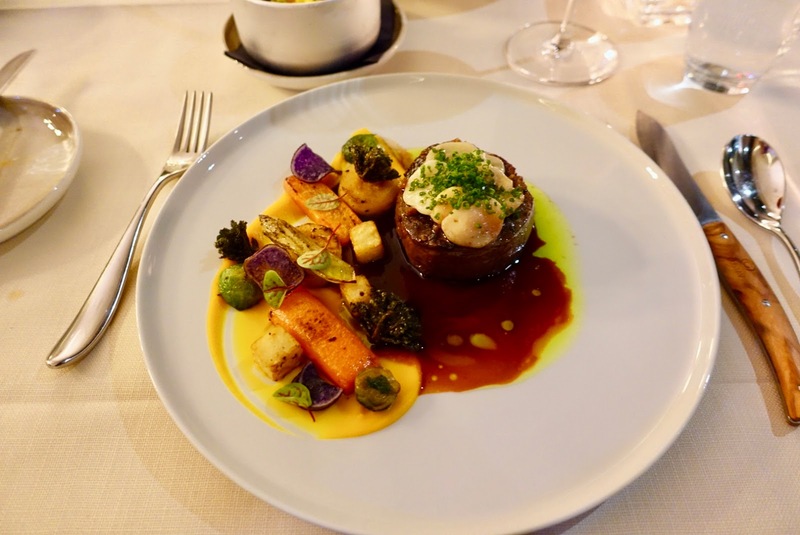 For main course, I went for Irish beef fillet with marrowbone, mushroom cream with potato foam and seasonal vegetables. While the meat was of good quality, it was a bit too fibrous and not strongly enough seasoned for my taste. However, I was much in favor of the slices of marrowbone that covered the meat, the meat juice and the vegetables. I felt less enthusiastic about the mushroom cream with potato foam, which was a bit slimy in texture. 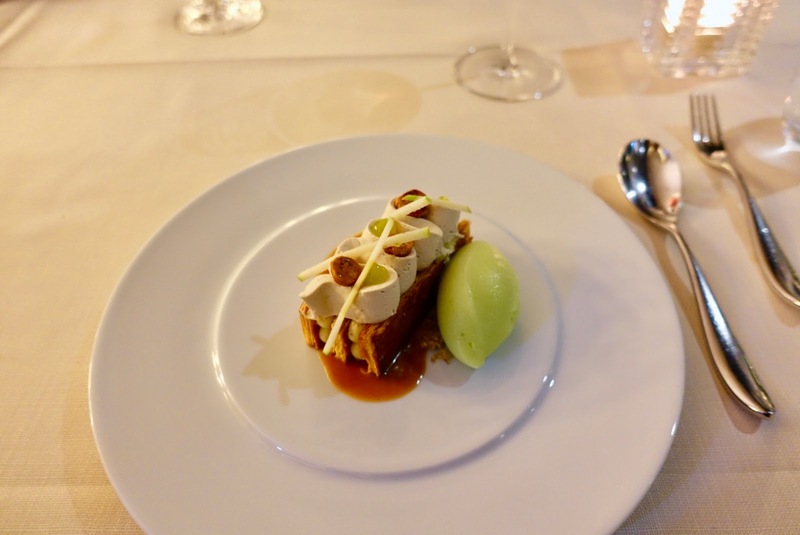 paired with chorizo, chickpeas and Madeira foam, an imaginative creation and a very tasty one too as a trial bite proved! 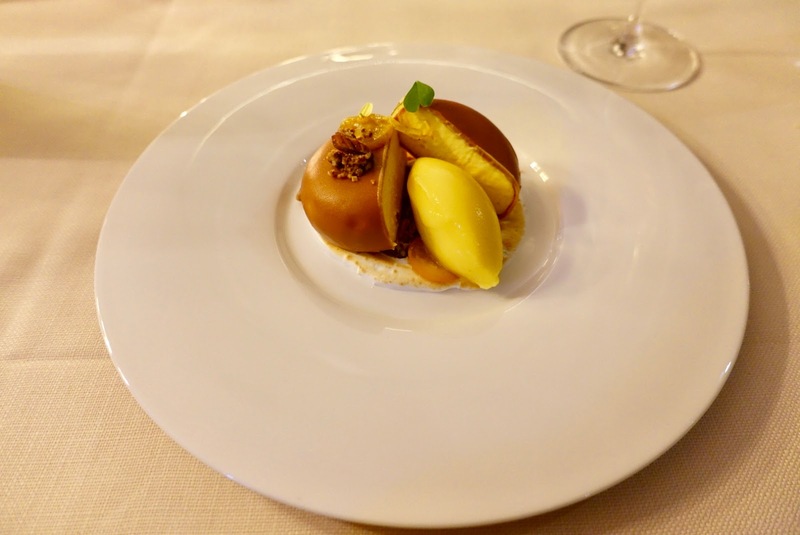 an ingenious combination of lemon cream, muscovado-almond crumble, cumquat and blood orange sorbet. 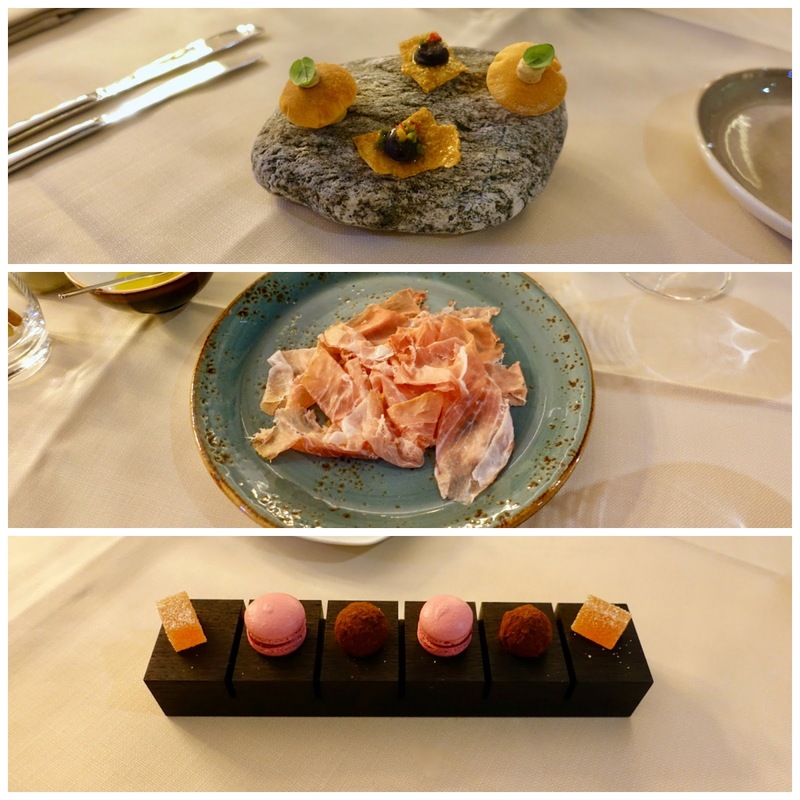 The dinner experience was framed by small bites, from which the wafer-thin slices of raw ham stood out most. 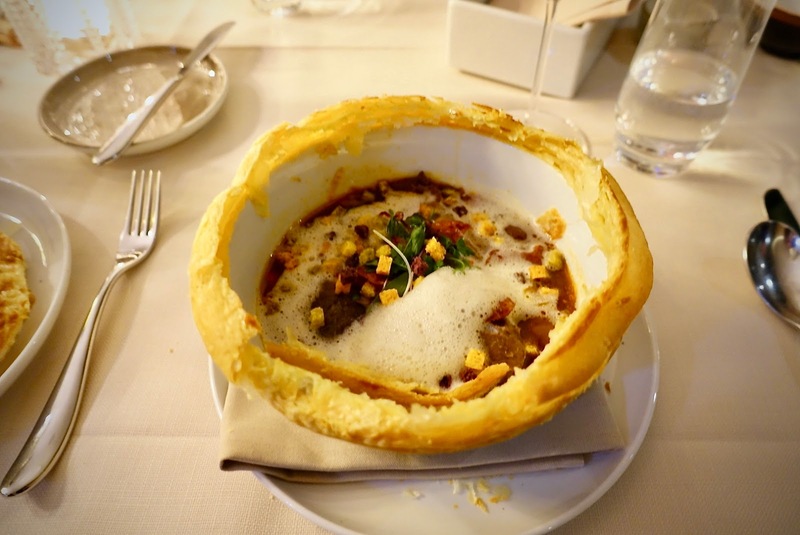 Antonio Coloianni is one of the hotshots in Zurich’s culinary scene. 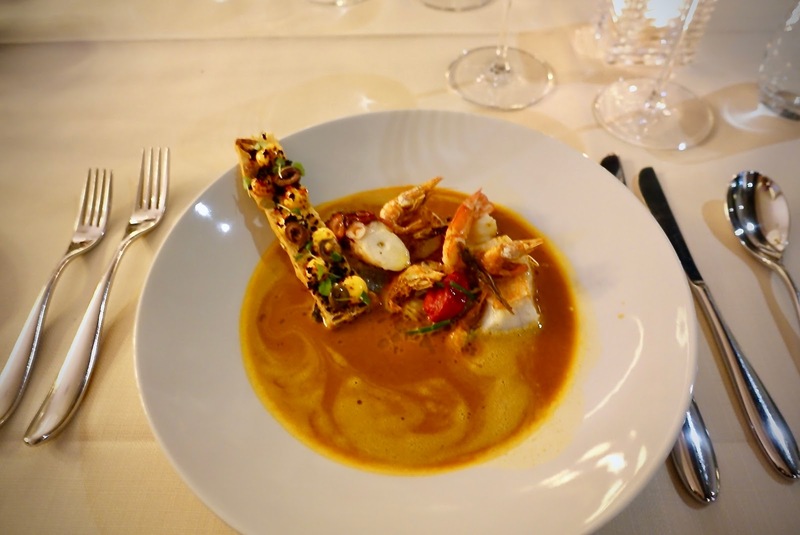 He is widely famous for signatures dishes just as his Bouillabaisse offering flavor combinations that linger long in the memory. His expertly crafted dishes, which are refined, inspired and original are worth to follow him along renown gourmet restaurants just as Mesa or Clouds. 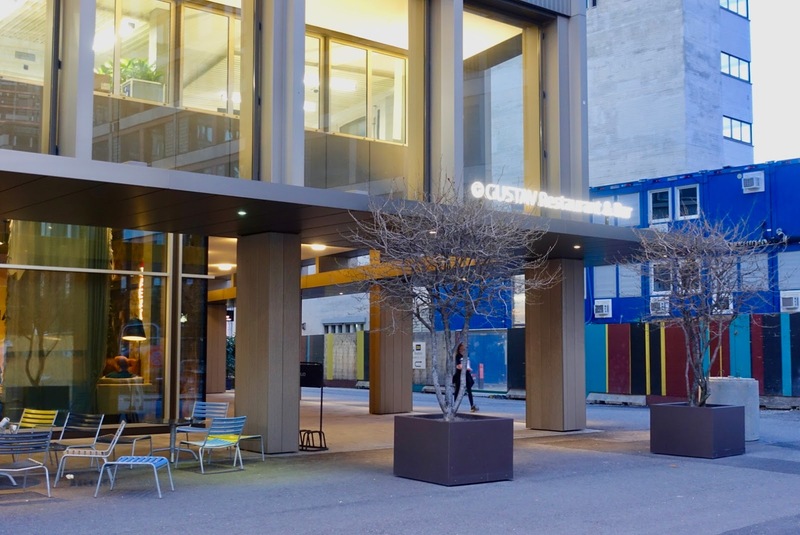 His newest place of work, where he is the culinary director, is Gustav, an impressive building complex and part of the emerging neighborhood of Europaallee next to the Zurich’s main railway station. Despite its enormous dining room, you feel at ease here enjoying culinary fireworks that are surprisingly fairly priced and of unusually good serving sizes.